All children love teddy bears, and some toddlers refuse to go anywhere without their special companion. So why not host your own teddy bear picnic? Combine eating outdoors with yummy food and furry friends, and everyone will be guaranteed to have a great time. Even the most timid of children will enjoy a Teddy Bear Picnic, as he or she will be able to invite a cuddly friend along for comfort. But don't limit your guests to bears. If your child prefers a favourite monkey, donkey, dolly or other soft toy, that's okay too. Picnics can be held anywhere, in your back garden, at the local park, in a playground. If the weather looks dodgy, your garden is probably the best place. That way, if the summer sun turns to gloom you can easily move inside and have the picnic on a blanket in the living room. To make the afternoon even more special, invite some human friends along as well. You may want to spend an afternoon making teddy-bear invitations your child can send to his or her real-life friends. Ask other parents to contribute a snack or two to spread some of the effort around. Planning a Teddy Bear Picnic is something even the youngest of children can enjoy. Make sure you have enough suitable bear-themed picnic food for the youngsters, including peanut butter or honey sandwiches, pieces of fresh fruit and water or juice. And don't forget something yummy the teddies will enjoy as well: honey, berries and teddy-bear shaped biscuits or cakes will go down a treat. The easiest teddy bear snack to prepare is the ginger bear - just use a gingerbread man-shaped biscuit cutter and remodel in the shape of a bear. You can also make rice-crispy or chocolate-cornflake treats reshaped into bear shapes, or fairy cakes made to resemble teddy bear heads, with raisins for eyes and Smarties or jelly-babies for the mouth. And whatever you do, don't forget the gummy bears for afters! 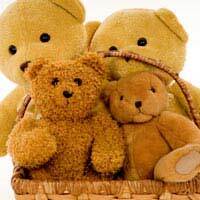 Plan a Teddy Bear Treasure Hunt, where children hunt for clues to find a special treasure. Read Goldilocks and the Three Bears, letting the children's bears and dollies act out the parts. Play Teddy Bear Tag, with whoever is “It” pretending a Big Bear hiding in a cave. Print teddy bear colouring pages off your computer in advance, then bring out the crayons. Sing the Teddy Bear Picnic Song. Assemble a Teddy Bear Clinic, with baby dolly beds, doctor's kits and other equipment. Sick teddies can have a rest at the clinic before continuing with their play. Eat the Teddy Bear food! A teddy bear picnic is a sweet, soothing summer activity that children of many ages can enjoy. Older siblings can come along as well, either bringing their favourite animals along for the ride or helping at the Teddy Bear Clinic and reading stories aloud to the younger ones. If the guest list gets bigger and bigger, make sure you invite other parents along as well. Have a beary merry time!